Based on the same “waveform technology” that is used by pacemakers to power heart muscles, the Ion Magnum uses micro-current frequency to contract the muscles in the body, stimulating normal exercise. Unlike muscle stimulators of the past that used electric currents to jerk the muscles to contraction, the high definition, pure analog frequency of this equipment smoothly contracts the muscle. The compact waveform frequency is specifically designed to mimic brainwaves so the muscle tissue is made to believe it is performing a muscle-toning workout. Also the effortless manner in which the Ion Magnum exercises the muscles causes the body to only use fat, rather than glucose (known to product lactic acid), for energy. The patient can therefore burn fat and achieve the same results as strenuous exercise but without raising body temperature, causing strain, soreness or exhaustion. The Ion Magnum is currently FDA-registered as a Class I device, which is the safest classification, meaning there is no significant risks for people of normal health. Areas that can be treated: almost any muscle group on the body. To achieve sustained fitness and good health, a 10 treatment program with sessions spaced 2-3 days apart is recommended. Maintenance treatments can be done once every two weeks. The system smoothly yet intensely works the muscles, burns calories and reduces body fat. While lying comfortably on the treatment bed, padding is strapped to specific target zones of the body. The signals from the Ion Magnum machine are transferred to the body through the padding. 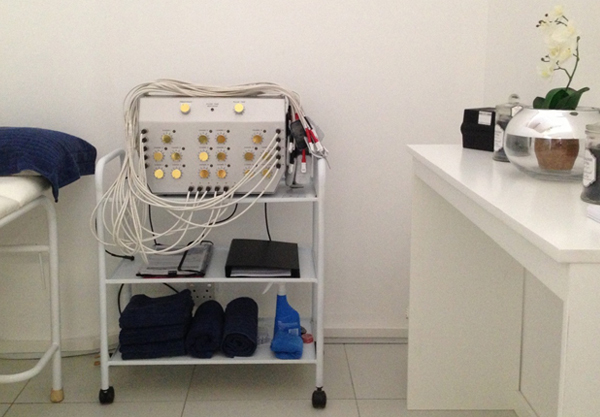 The system has 16 different channels which enable the arms, abdomen and thighs to be treated at the same time. Patients can read and relax during the session. Patients must remove outer clothing so the arms, legs and abdominals are exposed. Expect to experience vibrations in the skin as the muscles smoothly contract – you will feel the contractions but without any pain. If done regularly, combined with a sensible diet, you will fight the flab without having to hit the gym.